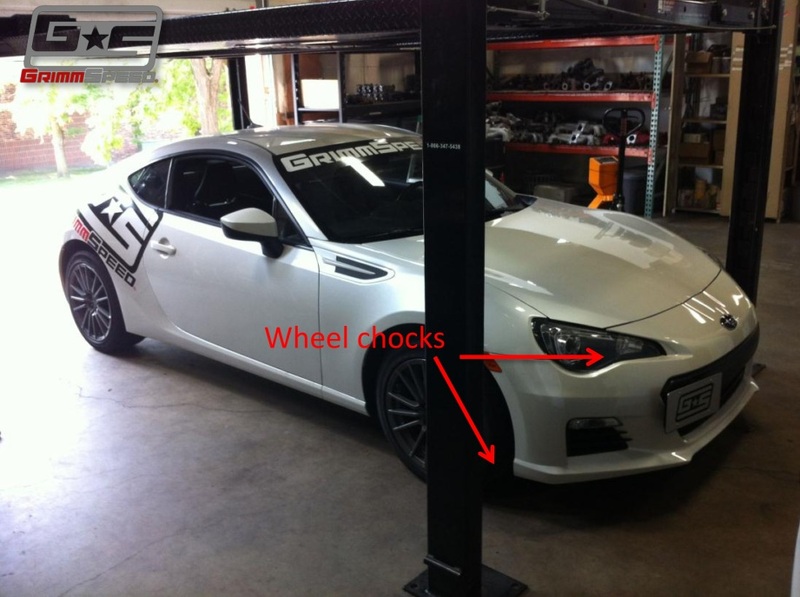 Introduction: This guide will illustrate how to safely raise and support your BRZ/FR-S. This guide is almost certainly more information than most people need, but for the sake of being thorough, we decided to err on the side of too much detail. Tools: The tools listed below are suggested for this task. Optional tools are noted. 1. 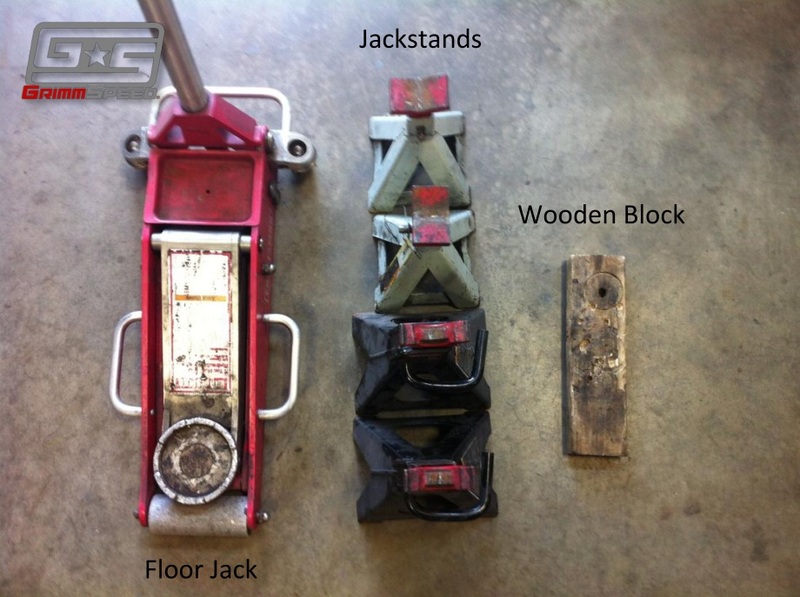 Gather your floor jack, four jackstands, and a piece of wood as shown above. 2. 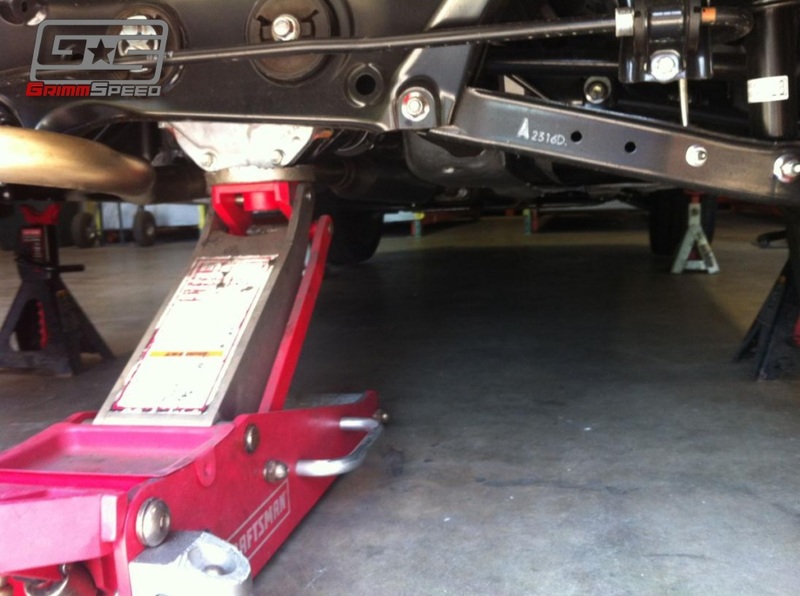 First, you will want to make sure that your floor jack can lift the vehicle high enough to allow the vehicle to rest its pinch welds safely on your jackstands. 3. Start by placing wheel chocks behind the rear wheels, then make sure that the parking brake is fully engaged. 4. 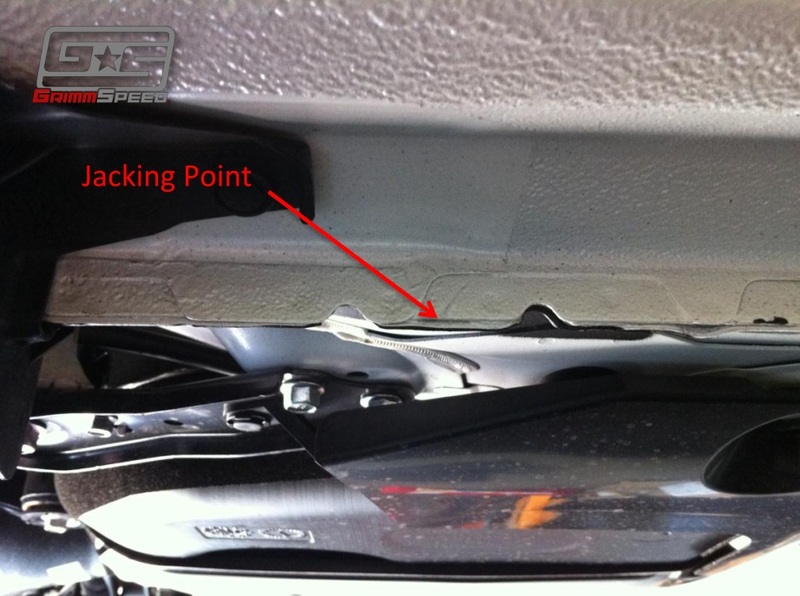 Next, locate the factory jacking points on the pinch welds located on both sides of the car. These are the places where you would use to jack up the car if you were using the OEM scissor jack supplied with the car. They are identifiable by having small notches taken out of the metal on the pinch weld on either side of the jacking point. The front point is located on the pinch weld just after the front wheel, and the rear point is located just before the rear wheel on the pinch weld. Grab your four jackstands and place one next to each of these points. 5. Locate the front jacking point. It is between the front plastic underguard and the front aluminum undertray. 6. Hold your board lengthwise on the jacking point. This helps to distribute the force evenly (and to prevent dents and scratches on your painted metal surface). Next, move your floor jack into place under the piece of wood. Alternatively, you can leave the piece of wood on the jack, and move the jack into place, but be very careful when lining up the wood to the jacking point as you don't want to damage the nearby plastic or aluminum pieces. 7. Slowly, begin to raise the vehicle and continue until the front wheels lift off of the ground. If you are the least bit unsure of your jacking point, lower the vehicle and check for any sort of bending or damage on the surface of the jacking point. Slowly lift the vehicle until it is high enough to slip the jack stands under the pinch weld at the factory jacking points. 8. Different jackstands have different designs for its "saddle," or the piece that the car will come into contact with. For this write up, we've used two different, albeit common designs, neither of which is ideal. The ideal jackstand would have the same slotted metal top that the OEM scissor jack has to hug the pinchweld, but such a jackstand is rare in the average garage. Chances are that one of these designs is exactly what you'll be using, and they work just fine so long as you take care. The idea is to place the pinch weld in the very center of the saddle on the jackstand. The goal is to NOT bend your pinch weld. They are fairly resilient, but you will be very disappointed if you don't take the precautions to prevent damage to this area. 9. Place the jackstands so the saddle is perfectly centered on the pinch weld, and so that it sits in the factory jacking area between the two notches cut out behind the front tire. SLOWLY lower the car until the pinch welds have almost contacted the saddle of the jackstand. Make any final position adjustments, and slowly lower the car all the way onto the saddle. 10. 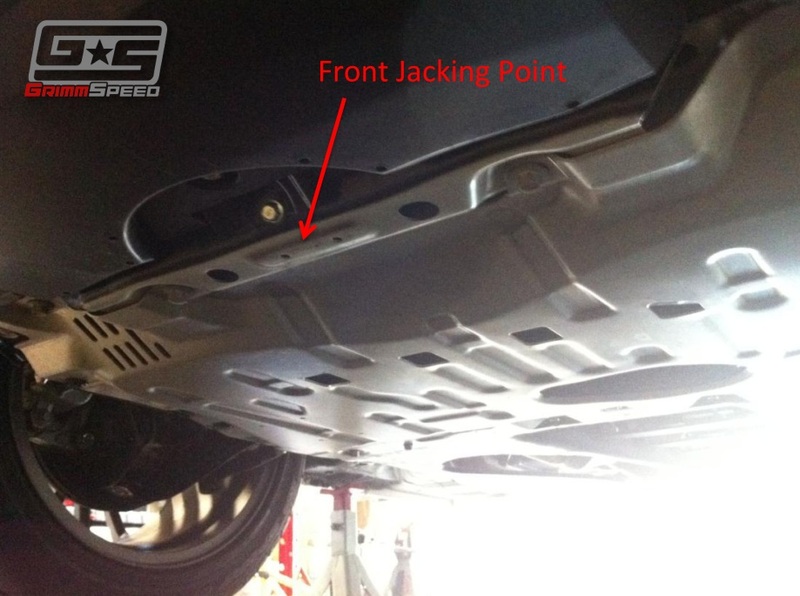 Move your jack to the rear of the car, and locate the differential, this is the rear jack point. Here, you can choose to either use, or not use the piece of wood depending on the shape of the cup on your floor jack. Assuming that you use the piece of wood to distribute the force on the differential, follow the same steps for positioning as you did for jacking up the front. 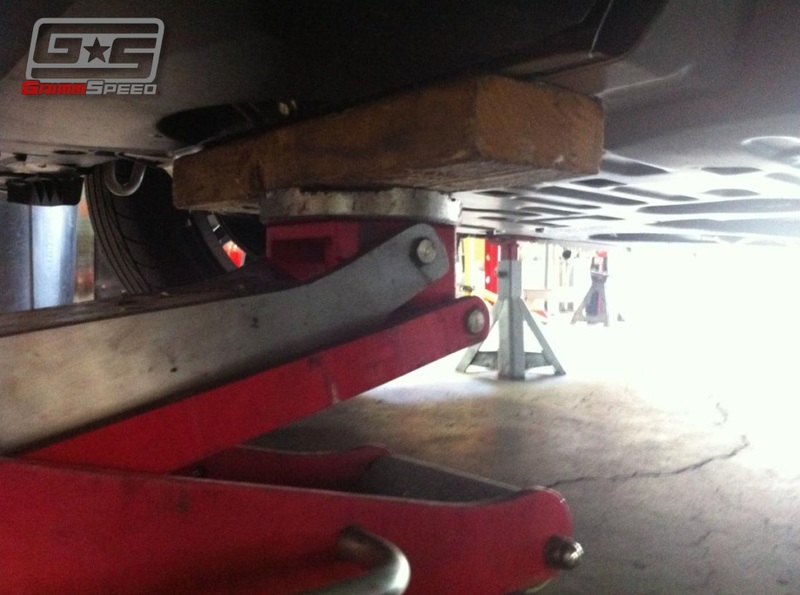 When you are positive you have the jack and piece of wood in the correct place, slowly begin to lift the vehicle until you can slide the jackstands under the rear factory jacking points on the pinch weld. 11. Place the jackstands so the saddle is perfectly centered on the pinch weld, and so that it sits in the factory jacking area between the two notches cut out in front of the rear tire. SLOWLY lower the car until the pinch welds have almost contacted the saddle of the jackstand. Make any final position adjustments, and slowly lower the car all the way onto the saddle. 12. To lower the car, follow the same basic steps, but in reverse. Start with the rear, raise the car by the differential, remove the jackstands, and slowly lower the vehicle to the ground. Replace the wheel chocks behind the rear wheels. Remove the jack, and bring it up front to the front jacking point. Raise the car up, remove the jackstands, and slowly lower the car the rest of the way on to the ground. Last edited by GrimmSpeed; 02-10-2014 at 01:20 PM. Good to know. Do you have an recommendations for a good but cheap jack and jack stands? No joke. It's too easy to forget that jacking and supporting your car properly is, without question, the most important part of anything you're doing under your car. As far as recommendations, it's pretty easy to get a good set of jackstands pretty cheap. Craftsman, Harbor Freight, etc all make decent jackstands. I've used a variety of jacks and they all have pros and cons. Some of the lighter, low-profile ones seem a little bit unstable to me, but a lot of people have been using them for years. I like the big, heavy jacks. Harder to move around, but they always feel nice and solid. Harbor Freight is good for stuff you're only going to use occasionally. Very nice write-up. Too often I see guys putting their car on jack stands not knowing that their cars have specific spots for both the jack AND the jack stands. 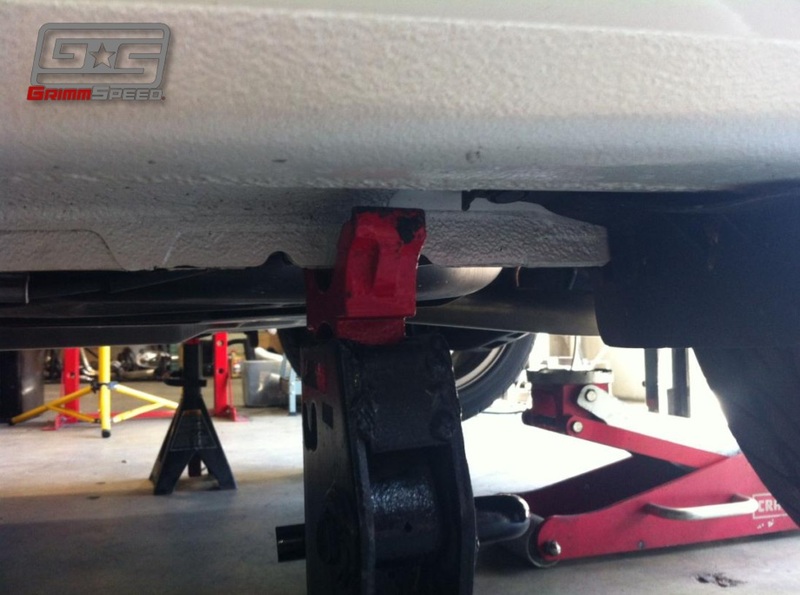 In the past, I've put my truck up on 2 jack stands to replace some bushings and only chucked the rear tires. Is it safer to put the vehicle up on 4 instead of 2? Just to add, here are the official diagrams from the repair manual on where to position the jacks & supports on the chassis: download. also, download the shop manual (download) and see pages 29-32. Last edited by azian_advanced; 07-02-2012 at 03:11 AM. Depends on what kind of work you're doing. As long as the vehicle is stable, I'd feel fine being under it with only 2 stands. If you've got the extra 2 stands, it won't hurt to spend another 5 minutes and put the car on them. EDIT: nm, jumped the gun before reading Hanakuso's post and duplicated it. Wheels under the car can save your life and limb. Thanks for this posting! I have a BendPak lift and kept looking around for suitable lift points. The pinch weld lifting points as shown sure look wimpy! I use hockey pucks with my lift to protect the paint and metal. Got to pull my Porsche off the lift and get the BRZ in the air soon for a mandatory peek at the underside. What BMW said. I will get hockey pucks and cut them to fit the pinch weld, as well as fit inside the jack stand. The fit is a little more snug, and absorbs movement from working under the car. Probably not a bad idea.. my buddies lift has thing pads on it already that the car sits on. My jackstands don't and I've never had a problem with any car moving on either setup, but anything that can make it more secure definately can't be a bad thing! I do the same thing at home, but my jack has a pretty deep 'pocket', so the puck stays in there at all times. Good tip!